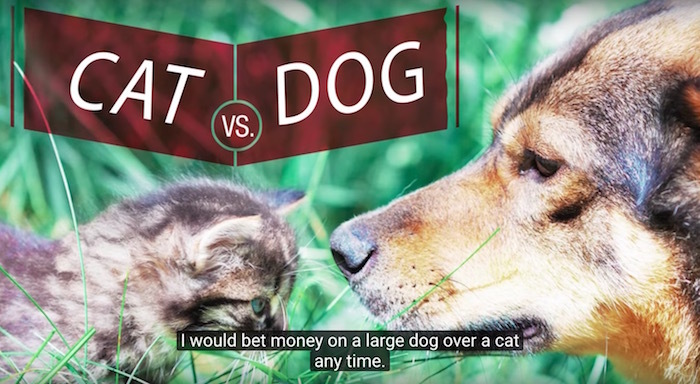 Ever wonder which are smarter, cats or dogs? You can teach dogs to sit, roll over, play dead, etc, which cats don't do on command. But hey, my cats can knock over water glasses and steal food off a plate when no one is looking – that oughta count for some kinds of smarts. Maybe they're just too "stubborn" to learn tricks because they're too clever to take orders from humans. Wishful thinking. The verdict is in, and cats are stupider than dogs. In the first study of its kind, researchers at Vanderbilt looked at the brains of animals, including cats, dogs, ferrets, mongooses (mongeese? ), raccoons, hyenas, lions and brown bears. Specifically, they looked at "the number of neurons in their cerebral cortex: the 'little gray cells' associated with thinking, planning and complex behavior — all considered hallmarks of intelligence," according to Vanderbilt. “I believe the absolute number of neurons an animal has, especially in the cerebral cortex, determines the richness of their internal mental state and their ability to predict what is about to happen in their environment based on past experience,” [Associate Professor of Psychology and Biological Sciences Suzana] Herculano-Houzel explained. Cats, don't take it too hard, you're in good company. Brown bears were also found to be dumber than previously thought. Although a brown bear has a "respectable brain," according to Herculano-Houzel, the study found that the brown bear has only one-fifth of the neurons researchers had expected to find.